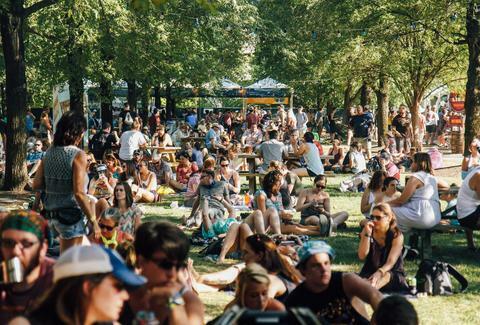 Summer is under way in Louisville, and there's a whole hell of a lot happening. From food and beer fests to dazzling firework displays and even more... food and beer fests, River City's doing it up right. Let’s just say we hope you got plenty of rest over the winter, because you’ll find there will be no shortage of fun activities for you and the family. The annual Kentuckiana Pride event has become a signature to Louisville, with thousands turning out each year to support equal rights and, well, have a good time with food, parades, and pageants. Soulfood like BBQ and fried chicken are just part of the Kinfolk Soulfood Music Fest, which also brings musical acts like Ready for the World, Cameo, the SOS Band, and more to the waterfront. Louisville boasts quite a few fine beer festivals, but this is the only one that focuses on Kentucky brewed beer only. OK, there will also be music and food, but this is your chance to get acquainted with 30 breweries from around the Bluegrass. It’s a veritable cornucopia of local and regional fare, from art to hot sauce, along with live music, local food, local spirits, and a cooking competition (also local, in case you didn’t pick that up via context). Family fun with a juried art show, live entertainment, a Children’s Fun Zone, food court, cake booth, a pet contest, and plenty more. Take the family to see the annual 4th of July Parade and Celebration, then stick around to shop and eat in this quaint Indiana Downtown. You see what happens, Lebowski? The original home of Lebowski Fest -- which pays tribute to the cult classic film “The Big Lebowski" -- keeps it rolling again in 2017 with music, screenings, special guests, and more. The festival for... the rest of us?? Designed as a poor man’s response to the Forecastle Festival, Poorcastle focuses on local music, with food trucks, cheap admission, fresh craft beer, and more. And it’s all for local charities! Tater tots and beer. Tater tots. And beer. Just let that sink in for a moment. This traveling event lands in Louisville July 9, and one price gets you lots and lots of samples of tater tots. And beer. Plus, live music and other stuff, but mostly the first two things. In one of Louisville’s most unique festivals, fans of Jane Austen gather each year to celebrate this author, her life, and her work, with workshops, shopping, and even a bare knuckles boxing contest for the guys. What more can we say about this music festival that brings bands and fans from all over the US and beyond to Louisville every summer? Heck, it even makes the news when the lineup is announced each spring. Two full lineups of blues bands from around the world, plus BBQ vendors and beer (and bourbon!) abound the aptly named Louisville Blues, Brews & BBQ Festival. Come hungry. And sober. If you love Jerry Garcia and the Grateful Dead, Louisville have a festival for you. Set on the banks of the Ohio River, this one features band after band playing Dead tunes, plus food, spirits, and fun. Star Wars to Dr. Who. Your inner-nerd will love Fandom Fest, with everything from vendor booths to personal appearances by your favorite celebrities from horror, science fiction, animation and more. Even “Weird Al” Yankovic is going to be there, so why wouldn’t you? One day each year, St. Matthews shuts down a portion of busy Frankfort Avenue to celebrate with bands, food, vendors, and activities for children of all ages, and that includes adults. Ah, yes, the Kentucky State Fair. It’s a time-honored tradition in Louisville, steeped in livestock, fried everything, live music, beer tents, rides, contests, and huge vendor floors. Step onto the Midway and become a kid again. A focus on music (lots of music) and local fare -- from crafts and beer to food to spirits -- is what the Seven Sense Fest is all about. It all happens in the Germantown-Schnitzelburg area. A long-standing annual fundraiser event for the Louisville Zoo, this brew festival is one of the city’s longest running and most popular. It features beer and wine from all over, plus food vendors, raffles and more. WorldFest is four days of celebrating cultures from around the world, with parades, music, arts, performance, food, crafts, and plenty of events for the family. Bluegrass and bourbon? Yeah, that pretty much sums up Kentucky. Both come together at once for this fun festival each year. Good, clean fun is the order of the day at this popular street festival that features a parade, live music, a dog show, games, fireworks, and lots more. Kevin Gibson is a freelance writer based in Louisville.